So much taste without the unhealthy MSG. Can't live without this brilliant invention. It lasts for a long time. Bought a bunch of these and was initially disappointed as the flavour was very weak, BUT I dug through it with a spoon and it improved dramatically. Perhaps not quite on par with the stuff you can get at almost every chip shop in Aus but it does the trick. 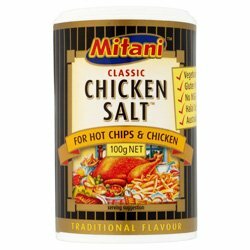 This is fantastic, especially mixing it with breadcrumbs when making a coating for homemade deep fried chicken, also fantastic to use when I make turkey burgers too, as well as using it for the usual chicken dishes also. ive been lookin for this egot this everywhere since my visit too australia 12 yearss ago and not for sale in the uk :D im sooo happy i got it at last !!! great tastin salt !!!!!!!!! !